We know how you feel about your big day and we want to help! Host your once-in-a-lifetime wedding reception in one of our newly renovated Winnipeg wedding venues. Rest assured, personalized service is a part of every ceremony or reception at the Victoria Inn. Our Certified Wedding Consultants will help you create a custom catered menu as well as provide planning assistance to ensure every moment runs smoothly. 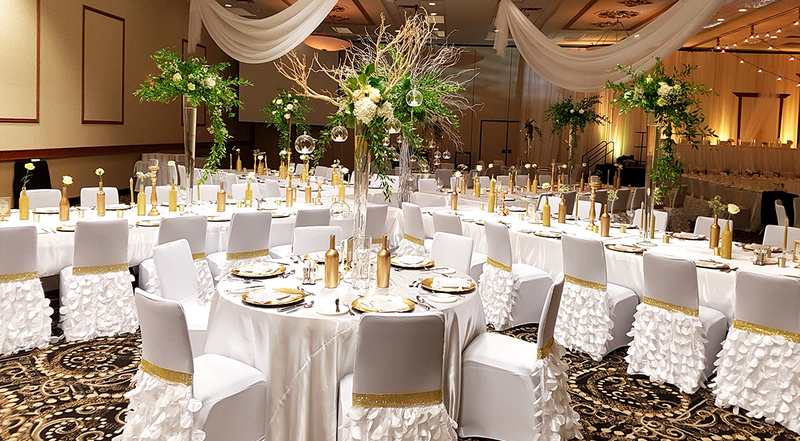 Our team in Winnipeg consists of experienced professionals who will work with you to set up everything from well-appointed event spaces to group accommodations. Our incredible team is one of the most experienced of all Winnipeg wedding venues. Your customized menu by our award winning Executive Chef will provide you and your guests the ultimate dining experience. Our culinary team ensures consistency, quality and is one of the most recognized of all Winnipeg wedding venues. We pride ourselves on having the latest cutting edge culinary technology of all Winnipeg wedding venues. This ensures we provide each and every guest with exceptional cuisine regardless of any unforeseen scheduling delays. We know weddings. Whether you’re an hour early or late, all meals will be superb. Choose the Victoria Inn Hotel and Convention Centre as your wedding venue in Winnipeg. Whether you are planning an intimate reception with close friends or a spectacular wedding showcase with 2000 people, we can make your special day unforgettable. The Victoria Inn offers a variety of classic spaces in our three unique ballrooms. The Centennial ballroom offers grand elegance with 16 ft ceilings, and 25,000 square feet of floor space allowing for an endless array of layouts and configurations. Our intimate Embassy ballroom is a perfect choice for a mid-sized reception. The room features classic chandeliers and a large central dance floor allowing you to dance the night away. The premier choice for mid-sized receptions, this impressive room is located away from our other venues, allowing for a more intimate night.